The "Speech Gene", of course, is FOXP2, and Wade's article covers a paper by Genevieve Konopka et al., "Human-specific transcriptional regulation of CNS development genes by FOXP2", Nature 462: 213-217, 11/12/2009. We've been muttering on this weblog for more than five years about the overselling of FOXP2 as "the Language Gene" or the "the Speech Gene" — for a recent summary of the issues, see "Mice with the 'language gene' stay mum" and "More on FOXP2", 6/5/2009. [T]he deceptive simplicity of finding correlations between genetic and phenotypic variation has led to a common misconception that there exist straightforward linear relationships between specific genes and particular behavioural and/or cognitive outputs. The problem is exacerbated by the adoption of an abstract view of the nature of the gene, without consideration of molecular, developmental or ontogenetic frameworks. […] Genes do not specify behaviours or cognitive processes; they make regulatory factors, signalling molecules, receptors, enzymes, and so on, that interact in highly complex networks, modulated by environmental influences, in order to build and maintain the brain. To place these gene expression changes within a more systematic context, we applied weighted gene co-expression network analysis […] to examine co-regulation of gene expression across all genes. 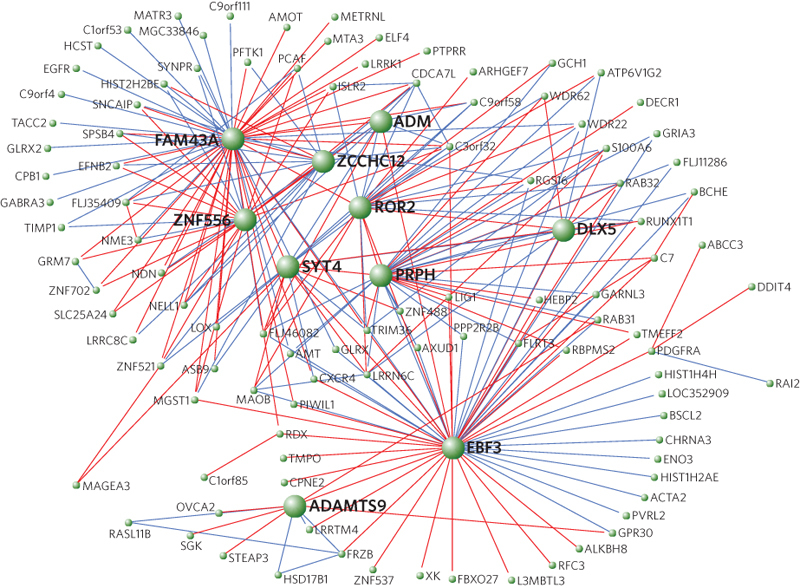 We uncovered two modules where the module eigengene […] was driven by differences in FOXP2 and FOXP2chimp, and one module driven by similar gene regulation […] Notably, two of the genes with the most connections, so-called 'hub' genes, in one of the differential networks are DLX5 and SYT4, two genes important for brain development and function. So this research supports the idea that the hominin mutation in FOXP2 has a biological effect, and perhaps an important one, apparently involving the interaction of a large number of genes with a large number of developmental and functional roles. It remains to be seen how this relates to human/chimp differences in anatomy, physiology, and behavior; and especially, what it has to do with speech, language, and communication. All animals have an FOXP2 gene, but the human version’s product differs at just 2 of its 740 units from that of chimpanzees, suggesting that this tiny evolutionary fix may hold the key to why people can speak and chimps cannot. [T]hey confirmed suspicions that FOXP2 was a maestro of the genome … Like the conductor of an orchestra, the gene quiets the activity of some and summons a crescendo from others. In other words, it's been known since its discovery that FOXP2, like the rest of the FOX family, is a transcription factor. Several of the genes under FOXP2’s thumb show signs of having faced recent evolutionary pressure, meaning they were favored by natural selection. This suggests that the whole network of genes has evolved together in making language and speech a human faculty. 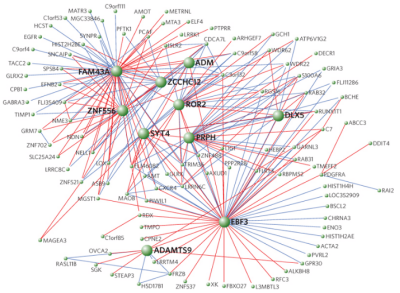 And some of the genes in FOXP2’s network have already been implicated in diseases that include disorders of speech, confirming its importance in these faculties. But the FOXP2 network is certainly not the only set of genes involved in language. And, he didn't add, language is not the only thing that the FOXP2 network is involved in. The "God Gene" is a different story altogether. To start with, it doesn't exist. It's basically nonsense to call FOXP2 the "language gene" or the "speech gene", but at least FOXP2 exists, and is involved in the development of various anatomical structures that play a role in spoken language (as well in eating, breathing, etc. ); and a FOXP2 mutation is known to be associated with developmental disorders that are partly linguistic. IN the Oaxaca Valley of Mexico, the archaeologists Joyce Marcus and Kent Flannery have gained a remarkable insight into the origin of religion. During 15 years of excavation they have uncovered not some monumental temple but evidence of a critical transition in religious behavior. The record begins with a simple dancing floor, the arena for the communal religious dances held by hunter-gatherers in about 7,000 B.C. It moves to the ancestor-cult shrines that appeared after the beginning of corn-based agriculture around 1,500 B.C., and ends in A.D. 30 with the sophisticated, astronomically oriented temples of an early archaic state. [G]enes that prompted the mind toward ritual would eventually have become universal. Think of the manifold advantages of head-coverings to paleolithic hunter-gatherers, and the near-universality of head coverings among human groups at all subsequent stages of development — the Hat Gene hypothesis is a winner all around. Still, I doubt that I could get funding for a Genome-Wide Association study looking for correlations with preferences in haberdashery. Coincidentally, there's Wade's new book The Faith Instinct, published Nov. 11, 2009. I'm holding out for The Hat Instinct, myself. But how come hats suddenly became much less prevalent around the mid 1960s? The gene pool doesn't evolve that rapidly. I think you overstate the case against Wade slightly. It's unfair to hold reporters responsible for their headlines, since they don't write those. And however much Wade may juice his ledes, usually he does get around to the actual science, which is more than you can say for many other science reporters. Indeed. Truly spectacular, and also completely and totally unexpected — unless you've been reading, and believing, the many stories over the years that use the phrase "language gene" to describe FOXP2. The overselling of this idea originates with (certain) scientists, alas. But journalists like Wade have aided and abetted them, probably because the "language gene" idea makes a much better story than the more complex alternatives, and has only the incidental and unimportant handicap of being false. I don't know about the hat gene, but there are clearly genetic factors for chopstick usage. If you do a genome-wide association study on the US population, for factors associated with efficient usage of chopsticks, you will find significant genetic variation. [(myl) Yes! If those old fogeys at NIH would just fund my study, we might find the Beret Mutation! And, of course, if we included religious affiliation in the questionnaire, we'd have a good shot at finding genes for Buddhism, Islam, Judaism, Santeria, etc. I think the real instinct that may explain Wade's book is the Greed Instinct. After all, books about the atheism/religion feud on one hand and pop evo-psych books on the other have done quite well in sales, so a book combining both sounds economically feasible — no doubt his publisher thinks the book will sell on the title alone, no matter how scientifically empty it is. You miss an important point. If the God Gene exists and is found, we can check whether it is present in animals or even plants and finaly decide whether they have souls. See, we can skip that animal communication trouble altogether on such a prominent controversy. I would write for a grant from Vatican. The problem with this is that morality (let alone "fear of divine punishment") is NOT a major feature of all religions, and historically-speaking, the strong association of morality and ethics with religion is a fairly recent development in many cultures. In the ancient Mediterranean/Near Eastern world, at least, the primary concern of religion was cultic practice (sacrifice, rituals, festivals), not moral behavior. The gods were more likely to punish someone for failing to burn the right goat than for theft. Right and wrong were more the provenance of sages and philosophers than priests. The association of morality with religion was part of what was novel about Judaism and Christianity (although it also could be found in some mystery cults and religio-philosophical schools like Neoplatonism and Neopythagorianism). This is not to say that religion didn't function as a source of social cohesion, but it didn't do so in the way people tend to envision it today. Proper religious observance was seen as a way of protecting one's social group from unpredictable divine powers (and often, it was the only way one could get meat to eat!). Well, it wouldn't be much of a stretch to think that the hat and religious traits coëvolved. And… what about the Gene Gene? Not to mention the Gene Gene Gene? Observable effects, inherited, and a terrific selective advantage, no? Would be a good start to disentangle the terminology. Church isn't the same as religion, which is not the same as faith. While it is possible to find a naturalistic explanation for faith as personal belief, I doubt there will ever be a good naturalistic explanation for religion [though church is another matter again]. A long time ago an acquaintance posed the question why Christianity [in all its very different colours] has been so successful, particularly when compared to multi-god scenarios or animistic religions. I find that much more intriguing than the attempt to find a sole answer to the question of why we believe in something beyond nature at all. Re: Funding Hat Gene research, you could almost certainly get funded for Hat Meme research, and then "discover" a genetic foundation (CAPon2). I say Go for it! Is there a "Jean Gene" for wearing pants? I entirely agree with Jack Collins' discussion of the lack of "morality" in ancient polytheistic religions, at least in the West. One can add that the various gods were far from being examples of proper human behaviour. The rituals needed to be observed in order to keep the gods from hurting you and your own and cajole them into helping you. When the god(dess) of an enemy tribe proved his/her power by giving the enemy the victory, the defeated tribe had better switch its allegiance to that divinity, which was obviously the more powerful one and would then become a protector. As several people have touched on, a huge problem with all attempts to produce a unitary "explanation of religion", including genetic ones, is that "religion" is not a single coherent phenomenon. For instance, some "why" questions that have occurred to me about religion at one time or another include, "Why did the scholastics find Aristotle's distinction between essence and accident was appropriate or adequate to explain the Eucharist? "; "Why did ancient Greek warriors have athletics contests at their funerals? "; Why did the ancient Israelites on the one hand have such a broad-ranging concept of ritual pollution, and on the other hand, remedy it with sacrifice? "; "Why do people think God will find them a parking space if they ask him nicely? "; "Why and how can contemplating the sublime induce a state of religious ecstasy (and what is that state and why does it count as religious)?" And there are many, many other diverse questions one can ask about "religion". Is it really plausible that there is a single (genetic!) explanation that covers both scholastic philosophy and athletics contests? Or both ecstacy and animal sacrifice? Or both iconoclasm the personification of the sea? FOXP2 is not the gene that makes language happen; it’s unlikely that any single gene exists solely to enable us to communicate. But genes like FOXP2 interact with other genes in complex ways to build a language-ready brain. FOXP2 could have a leading role in this process because it is a transcription factor — a protein that binds to and controls genetic information within cells. Scientists believe the FOXP2 protein may help other genes express themselves in the developing human brain in ways that ensure the learning of speech and language skills. I maintain a possibly vain hope that in my lifetime I'll see the topic of the genetic basis of human behavior largely de-ideologicalized (if I may be so bold as to use such a clumsy neologism). At present, where any individual stands on this has everything to do with the particular behavior in question and one's politics. For example, one can largely deny a genetic basis for behavior except in the case of sexual orientation, where one strongly asserts it. Conversely, one can strongly assert a genetic basis for behavior with regard to gender roles and such, but strongly deny it in the case of sexual orientation. The actual science involved has very little to do with what positions one takes. I find this infuriating. With regard to language, it should be mentioned that for a good while now one cause of confusion in popular arguments about this is the distinct meanings of the technical term "gene" in the fields of ecology/evolutionary biology versus molecular biology. In the former, gene is an abstract term, referring to the smallest unit selected for/against. In molecular biology, it refers to an actual biological structure. Therefore, in ecology/evolutionary biology, one can refer to a "gene" which controls some feature that, in molecular biology, is perhaps a complex of genes along with other biological units and processes at the molecular level. To criticize an ecological/evolutionary biological argument about a "gene" on the basis that there's not actually a single molecular biological gene behind this is a category error. It's like the mistake of claiming that tomatoes aren't vegetables, but are fruits. Anyway, what I find most annoying about these genetics debates is that they reduce to the old nature/nurture argument where each side, for the purposes of the debate, defaults to some absolutist position. But pretty much everyone understands that the absolutist positions are unreasonable and that all human behavior is obviously the result of the interaction between both biology and environment. Nevertheless, it is too attractive, too tempting, to take one of the absolutist positions for political purposes. And all the science becomes politicized. It corrupts the science because science occurs in the context of the larger culture—and because of funding, often the larger political culture. But also the politicization of a scientific issue results in the field attracting those with an axe to grind, thus entrenching it. You can see this happened almost immediately in the case of sociobiology and evolutionary psychology. I think both fields are legitimate and important, yet there's many researchers who have a stake in the political wars over genetics and human behavior (mostly on the politically conservative side) and who consequently produce research supporting that political position—which, of course, the political opposition derides and the integrity of the entire field is called into question. It's a travesty, in my opinion. What I wish is that commentators, such as LL and others, who decide to weigh in on these issues would stop and consider their own political biases and the fact that those political biases almost always result in taking inconsistent positions on specific behaviors. Public commentary on these issues usually takes the form of either unquestioning endorsement of a genetic basis for a behavior, or an unquestioning ridicule. And rarely are such commentators equipped to evaluate this research. After reading the article, I think it is also misleading in implying that Marcus and Flannery are sociobiologists. Their work has focused a lot on cultural evolution, how human cultures develop and change in systematic ways over time. This is not biological evolution. Cultural evolution is not about genes, god-, hat-, or otherwise. (Except in the broadest sense that culture is made possible by humans' genetic makeup.) To equate their work with that of Wilson is to conflate software with hardware. As to the evolution of religion, the arguments have advanced in the century since Durkheim's simplistic and unilineal model. If you're interested, it's worth looking into the primary sources instead of relying on a newspaper article like this one. Religion does seem to be one of the few cultural universals. That's interesting. And, though the picture is far from simple, if you look at the patterning in time and space it is clear that certain kinds of religions are linked to certain kinds of political and economic systems. Marcus and Flannery's Oaxaca data are interesting because they show the change in religion over time parallelling other social changes. They argue that religion was used as a vital tool in legitimating the change from egalitarian villages to a class-based state. A lot of discussions about "religion" or "the state" or "the market" ignore what Michael Mann called "promiscuity" – the human tendency to use whatever's available for multiple purposes, depending on the situation and what works. Balanced by the other tendency, especially strong among academics, to try to sort things into neat categories, (and often then insist that use inconsistent with the category is somehow improper). Ancient religion was as promiscuous as religion is now – sometimes it was about morality (Antigone justifies her defiance of Creon in terms of obedience to Zeus as lawgiver and upholder of the right), sometimes about ritual, and sometimes about other things (some authors postulate that Sumerians thought of religion as a branch of accountancy, or maybe vice versa). Is there a parallel with language here, in the endless debate over the right meaning of a word? Maybe we could find true happiness if only we could identify (and then remove) the Messiness Gene. I know this posting is about spurious reporting of seriously interesting science, but I thought you and Geoff might enjoy reading a posting of a scan of a transcript of a found microgroove disc copy of a now-lost tape recording of a speech by Nobel chemist Irving Langmuir about what he called Pathological Science. Maybe everybody but me already knew about this? I think you can womble a genomic difference between people who can speak articulately, and dogs, who can't. Other people know a great deal more than I do about the genetics. I'm especially unfamiliar with the details of what FOXP2 does in humans and other species. But it's entirely possible ( in the abstract ) that the gene might normally have nothing at all to do with language, but that a defective version of it could make a protein that acts as a toxin, destroying parts of the brain involved in language. In "The Extended Phenotype," Dawkins spells out what "a gene for X" means to evolutionary biologists … it's quite different from what the phrase means to most people. If two alleles are competing for the same locus, and individuals with one of them exhibit some phenotypic trait – no matter how long and tortured the chain of causality – that's a gene for that trait. It isn't the gene that actually produces pigment, but the one that regulates it, that would be called a gene for a particular fur color. By that logic, FOXP2 might count even if it has no normal role in language. I think this would count as an example of "nerd speak." "A gene for X" makes perfect sense, and must be useful shorthand for people who do this sort of work, but once it winds up in the headlines, people read the phrase in an entirely different way. No. He merely described what a "gene for X" meant to him, and maybe others of his pre-molecular generation. But nearly every evolutionary biologist today under the age of 50 grew up with molecular biology and doesn't think of genes as abstract Mendelian factors for traits. Just abut the only people who still think this way are the evolutionary psychologists — who are rarely actual biologists. If two alleles are competing for the same locus, and individuals with one of them exhibit some phenotypic trait – no matter how long and tortured the chain of causality – that's a gene for that trait. Many mutations are lethal. According to this logic, the wild-type alleles are "genes for life". Not a very useful way to think. And as far as lethal mutations go: if we want to know why a particular allele has been selected against historically, and is not seen in modern populations, "causes death" is a pretty damn good reason. We don't talk much about the evolutionary significance of this because it's kind of trivial. @Tim Silverman: The selective pressure on FOXP2 can be studied in quite a few ways; probably the most tractable way is to do a dN/dS study. This is what modern evolutionary biologists do; we use the sequence information to both suggest and test evolutionary hypotheses. While this sort of thing used to be called "molecular evolution", that term is becoming a bit quaint — even field biologists are using molecular techniques now, not just the boffins in lab coats. The 'hat gene' argument is essentially the same criticism that Philip Liberman leveled at generative linguistics in a 2007 Linguistic Review article. That is, if cross-linguistic regularities in syntax indicate the presence of an innate, universal grammatical component of the mind, then the cross-cultural similarities in clothing suggest a universal clothes grammar. JB: Phenotypic genetics has a century of priority. It's easy to see why molecular geneticists overloaded the term "gene" for their own uses; at the time locating "the physical basis for genetics" was a major attractor of grants. That demanded that the DNA fragments they were fooling with be called "genes". It wasn't particularly honest to equate them at the time, and it's even less so now. The honest thing to do would be to use a different term. "Codon" could probably serve. The "God gene" kind of argument is worse, in my opinion, because we don't even have a measurable trait that can be argued to be heritable, we just have a (rather vaguely stated) cultural universal, along with a (rather tendentious) argument about the group-selection value of religious culture. @Jonathan Badger: I was wondering if you'd say something like that. The problem with this sort of study is that, while they are interesting in many ways, and potentially they will hook up with something functional, they aren't instrinsically functional, and natural selection is largely about changes to function (i.e. what the gene is "for".) You don't want to be reduced to saying "this gene is for having either gly or ala at the end of this bit of α-helix". You want to be able to say, "this allele was selected over the other one because it increased visual resolution"—in that context, the gene is then a gene "for" (more acute) vision. Of course, you don't then go and abandon the goal of understanding the mechanism of the gene's action; you ultimately want the whole picture to be integrated together. And maybe in that integrated picture the whole idea of having a gene "for" any particular thing is (almost always) a misleading way of putting things. But conversely, no matter how complicated the mechanism of action, ultimately selection is a matter between two phenotypic expressions, in which one functional factor with respect to the environment is likely to be dominant; and we don't want to abandon that insight either. What I'm after is a fragment of DNA that is transcribed and expressed, or suppressed, as a unit. What complicates matters (in biology everything is complicated) is that some transcriptions are "polycistronic", so one resulting mRNA strand codes for several separate proteins that will typically work together. Of course there are numerous more complicated ways for cistron products to interact, promoting or suppressing one another, making clear terminology difficult. There seems to have been an attempt to rename phenotypic genes as "polygenes". Probably, retiring "gene" itself out to the pasture of newspaper headlines and barnyard lore, and replacing it with more precise terminology, is the way forward. I didn’t mean a criticism of the interpretation here on LL. I just meant that many commenters seem interested in this issue of social evolution and religion, and that there’s a large body of work on the subject that is superior to Wade’s article. Since I’ve gotten myself into this, I suppose I should back up this assertion with some detailed recommendations of sources. Well, Marcus and Flannery’s Zapotec Civilization (1996) is a good start. For those who want a shorter version, try their chapter in The Ancient Mind: Elements of Cognitive Archaeology (1994, Renfrew and Zubrow, eds). Another good starting point might be A Reader in the Anthropology of Religion, edited by Lambek (2008), but this book is not all focused on the relation of religion to cultural evolution. Then, Levi-Strauss The Savage Mind (1962), Mythologiques. Sahlins Poor Man, Rich Man, Big-Man, Chief (1963). Rappaport Pigs for the Ancestors (1968) and Ritual and Religion in the Making of Humanity (1999). Geertz Religion as a Cultural System (1966) and Negara: The Theatre State in 19th Century Bali (1980), Turner The Ritual Process: Structure and Anti-Structure (1969), Hodder The Meanings of Things: Material Culture and Symbolic Expression (1991). Yoffee Myths of the Archaic State (2005), Renfrew Prehistory: The Making of the Human Mind (2008). Plus various ethnographies and archaeological case studies. In very broad terms, more hierarchical societies are usually associated with more hierarchical religions in which certain subgroups have exclusive claims on access to the supernatural. The more egalitarian a society, the less institutionalized its religion. Over the course of human history, in general, societies have become more hierarchical. This is either reflected in or partially implemented through changes in religion. The distinction between cultural evolution and biological evolution is important to understanding why we will probably never find genes coding for specific complex social behaviors. Humans characteristically deal with challenges using cultural means, rather than biological ones. If complex social behaviors were genetically hardwired (eg the “shopping gene”), we would lose the flexibility that has served us so well. For instance, moles have evolved specialized digging feet. When humans need to dig, we make a shovel instead. So when circumstances change, we aren’t stuck with the prospect of going extinct or evolving new appendages over thousands of years. @Ryan Bennett: Surely that was Philip Lieberman, rather than Philip Liberman, who wrote that 2007 article. .
Mark, in response to your questions about my assertions regarding the nomenclature of "genes", I believe that the discussion which follows my comment is sufficient to point you in the right directions. It also seems to me that if this discussion comes as news to you, then perhaps you should reassess your competence for posting about genetics. You implied a connection between atheism and a lack of hypocrisy. Are you totally sure atheists are never hypocritical? [(myl) It used to be true almost everywhere that if you weren't (at least apparently) religious in a locally-permitted way, you'd be unemployable, shunned, or even killed. This is much less often true today, and in consequence, many people who in earlier times would have pretended to be religious, now don't. This doubtless explains some fraction of the decline in religiosity — maybe all of it. There aren't any significant contexts where there are serious adverse life consequences for those who don't pretend to be atheists. So in this sense, the distribution of hypocrisy is asymmetrical with respect to religious belief. A trope of literature is the crusty old coot who pretends to be angry and unfriendly but secretly does good deeds…how come that character never gets called a hypocrite?